The Resident Council is just as it sounds—a council consisting of residents that meets monthly to discuss everything from outings and activities to community service opportunities and meal planning. 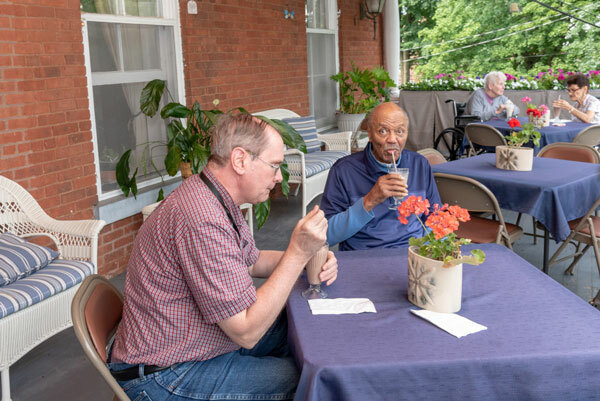 An excellent resource for both staff and residents, the Council helps us to continually enhance the quality of life for those who live at Vassar-Warner Home. Vassar-Warner Home prides itself on being a community within a community. Beyond our front door lies the vibrant city of Poughkeepsie and the historically rich and painterly scenic Hudson Valley region. With open hearts, our residents generously donate their time and talents to these wider communities. At Vassar Warner-Home, there are dining options for every palate. Our chefs work in tandem with a licensed dietician to ensure all meals are both nutritious and delicious. Whenever possible, our chef prepares meals using fresh, locally sourced ingredients from Hudson Valley farms and purveyors, including from the Vassar-Warner Home Gardening Club’s on-site vegetable and herb garden. The Menu Planning Club meets with our chef to discuss what residents are looking for – or not – in meals and works to incorporate their feedback. Accommodations can be made for different diets including no-added-salt, no-concentrated-sweets, mechanical-soft, gluten and allergen-free. Evening snack and beverageResidents’ guests are always welcome to join us for daily meals (for a nominal fee) and for all special events. 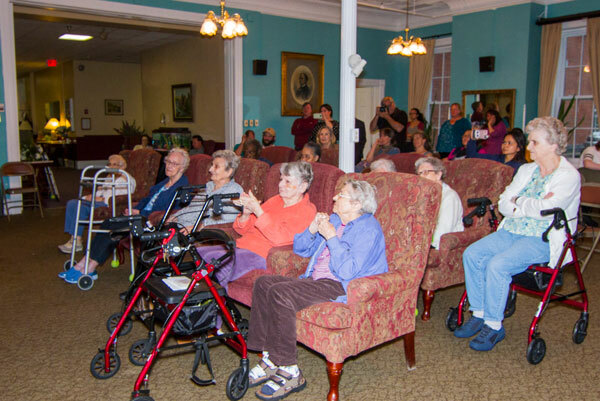 At Vassar-Warner Home, resident seniors are engaged in the world and with each other. They make friends, reminisce about the past, attend plays, greet newcomers, volunteer, bake, write, sing and learn. Shopping! Residents particularly enjoy shopping at the local dollar store! Visits from local groups, such as Christmas carols sung by members of the Girl Scouts of America and students from the Poughkeepsie Day School. Poetry readings by local authors. Participation in the “Big Read”, an annual, community-wide book club. Travelogues shown through video documentaries or shared by a staff member back from a fascinating trip. Movies and classic film fests, such as Casablanca and The Sound of Music. Arts and crafts club projects, including the on-site “Arts for Healing” program led by a team from The Art Effect, https://feelthearteffect.org/. Gardening club, where members tend to herbs, flowers and vegetables that grow in flats behind the Vassar-Warner building. Baking club, whose participants meet monthly to bake sweet and savory treats, sometimes choosing a secret recipe shared by one of our residents. Late afternoon Happy Hour with alcoholic and non-alcoholic beverages. Trips to a local play or museum. The Roosevelt Library in Hyde Park, with its still relevant history of World War II, is a frequent choice. 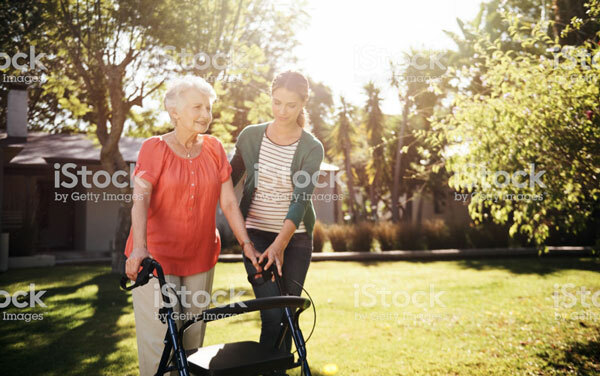 Vassar-Warner Home is committed to helping residents stay healthy in body and soul. For a list of the residence’s calendar of events, please contact us. Fitness and fun go together at Vassar-Warner Home, where our priority is to ensure our residents remain independent and in good health. Planned activities keep bodies moving, benefitting participants’ physical, mental and emotional health. 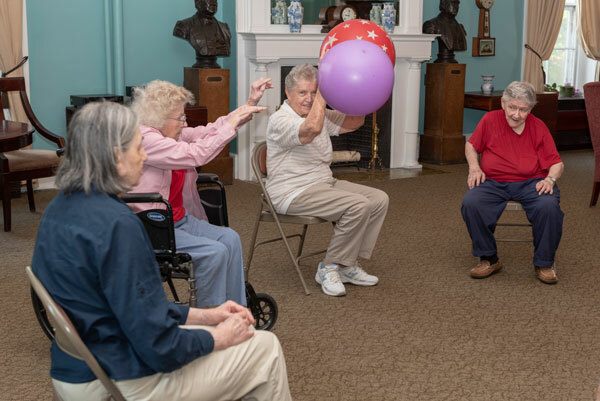 From a simple ball toss to regularly scheduled walks through our historic Poughkeepsie neighborhood, Vassar-Warner Home’s active programs provide great ways to socialize while promoting a healthy body. In addition to monitoring residents’ changing health needs, Vassar-Warner Home’s professional staff is on duty every day of the week, 24 hours a day, to attend to occasional physical ailments and illnesses. In the event of an emergency, Vassar-Warner Home is within a few miles of two top-notch Poughkeepsie hospitals: Vassar Brothers Medical Center and MidHudson Regional Hospital. Vassar-Warner Home welcomes residents of all faiths. Many residents choose to worship at the home, taking advantage of regular on-site services that include Catholic mass, nondenominational sing-alongs, and monthly communion. Residents also watch services on TV, receive visits from local clergy and attend services off-site with a family member or volunteer. And when it comes to holidays, we happily celebrate them all! For a copy of our latest calendar of events, please contact us. 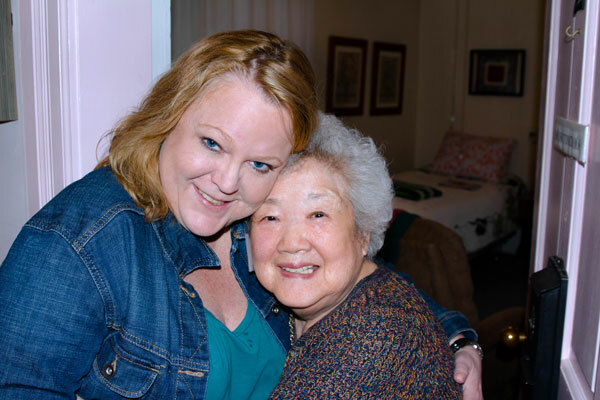 We believe that quality care is enhanced by strong partnerships between families and staff. Our team is always are available for questions or concerns and encourage family members to join us as much as possible. Family Nights: Typically held once per month from September to June, Family Nights allow family members to get to know the staff and the staff to get to know residents’ families while enjoying delicious food and entertainment. Open Meals: Family members are always welcome to join us for meals for a nominal fee. On special occasions families are invited to join us for special gathering or event in our dining room. Visiting Hours:Residents are welcome to have visitors at any time they choose. We do ask that visitors be respectful of quiet hours, which begin at 8:00 pm. Special Occasions:Families are encouraged and welcomed to visit for birthday gatherings, holidays and other special occasions.